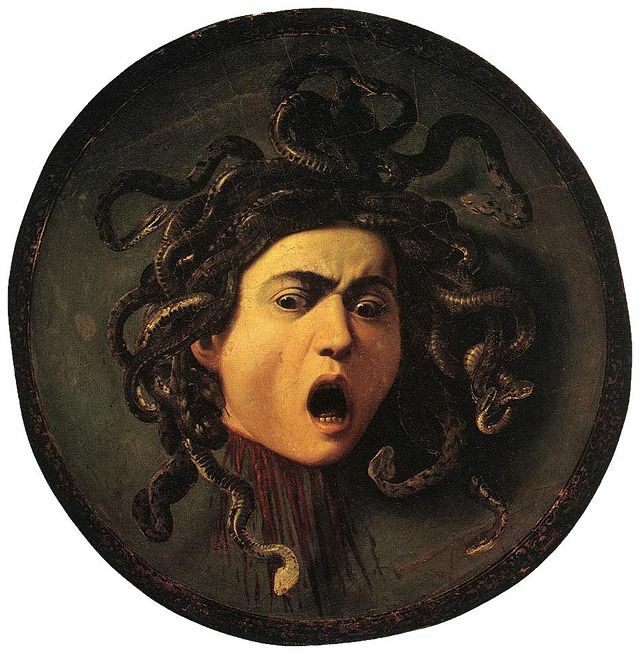 “Medusa” by Caravaggio. Courtesy of Wikimedia Commons. Families on vacation, truckers, solitary traveling businessmen, hipsters on road-trips, as well as hungry locals, all landed in the Midway at one time or another. As far as diner food went, the menu listed the standard, predictable fare, but what came out of the kitchen was wonderful. And the service was stellar, especially if you were lucky enough to have ‘lissa as your waitress. That’s no typo; she spelled her name apostrophe little l-i-s-s-a. Maybe it was short for Melissa, maybe it was a fanciful spelling of Lisa, maybe it was entirely made up when she was a teen searching for an identity. It was unique to her, and that’s what she wanted. She never became annoyed when folks asked her about the spelling; in fact, she liked the attention it brought her. The world, she said, is full of too many people sharing the same names. Where’s the individuality? We might as well all be named John and Jane. The family at the table smiled and nodded and dug into their meals. They didn’t care, one way or the other, what the neon creature was; they only wanted a photo and a filling lunch. The family nodded and smiled, and continued to chew. His older sister elbowed him as she giggled through her bite of cheeseburger. The parents just shook their heads at their silly kids. No one stopped eating. “Well, remember, my name’s ‘lissa,” their waitress said, pointing to her red and white plastic name tag. “If you need anything else, raise your hand and give a wave. I’ll be over in a flash.” Then ‘lissa turned on her heel and bounced back to the counter. The last customer of the night rolled in a little before 10:00. He sat down at the counter, stretching his long arms and grunting to catch ‘lissa attention. It worked; she looked up from her crossword puzzle and scurried over to him. “Yeah, sure, an ice tea would be nice, darlin'” the customer replied, flashing ‘lissa a smile full of chalk-white teeth. “Okey dokey, sugar, I’ll be right back with that,” she said before turning away. The volley of flirtation between the two continued through the stranger’s meal. He seemed to want conversation, and ‘lissa, as always, wanted the attention. Finished with his chicken fried steak and collard greens, the stranger pushed his clean plate away and motioned for ‘lissa to come over once more. She practically skipped to him. This was the perfect opening for ‘lissa to her perform well-practiced spiel. The stranger listened, and nodded, and asked all the right questions to keep her talking. “So you all call it Olly, though really it should be called Medusa,” the stranger pointed out. “What power? Stinging hair?” ‘lissa giggled. Now ‘lissa got spooked by the turn the conversation took. Without a word, she pulled out her pad and tore off his bill, sliding it across the counter to the stranger. ‘lissa stopped, and turned around. “How so?” she asked, interested. She kept her distance. “Well, the story goes, Medusa was so beautiful she attracted the unwanted attention, if you catch my drift, of Poseidon. In today’s legal terms, we’d say he sexually assaulted her. So the goddess Athena, who felt sorry for her, gave her snake hair, and the ability to change men into stone. To protect her from further harm.” The stranger drank the last of his tea, and rattled the remaining ice cubes. ‘lissa didn’t know what say. What an odd story he shared with her. She relaxed, but was now suspicious of her customer. What was he getting at? ‘lissa blushed and pushed a stray tendril of brown hair back under the green silk scarf she wore at work. It came loose again and fell back into her face when she leaned over to gather the dirty dishes. “Uh huh,” ‘lissa answered distractedly as she wiped the counter top. “—get swallowed by a giant wave, dragged out to sea, and disappear.” she interrupted. “My, you are a feisty one,” he laughed. “She’s been here more than 10 years. You just now find me, or just now started looking?” ‘lissa undid the scarf around her head, and shook loose her wavy hair. Under the fluorescent light of the diner, it seemed to undulate ever so slightly. In that moment, she went from pretty to stunning. “—and get knocked up? Have you bail when I’m about to pop? No thanks.” As ‘lissa became more agitated, her hair clumped into dreadlocks and began to squirm. Tiny sparks flashed on the ends coalescing into tiny eyes. Needle fangs sprouted in tiny mouths. “I think you need to go while you can still move,” ‘lissa quietly threatened. “You’re not a god,” ‘lissa whispered though a tight smile. “You’re a wannabe hero. Poseidon is a god, and he lost interest in me a long time ago, thank you Athena. There’s a reason why she’s the goddess of wisdom. Shame on you, impersonating your betters. Shame on you, thinking I’m stupid just because you’ve read Ovid and assume that I haven’t. Shame on you for attempting to lure me to my doom, like I’m some easy slattern.” Her eyes sparked like a roman candle, set alight by self-righteous fury. And that was that. The stranger froze in mid-stoop as he rose from the counter stool, his hand reaching inside his jacket. Was he reaching for his wallet, a cell phone, a weapon, or—most likely, a mirror? ‘lissa didn’t know or care. She leaned close to the statue’s surprised face. “Ovid got the story right, for the most part. Except for that bit about Perseus, that “hero” who took me down. I gave that poet permission to use his license. A mirror employed in ending me? Clever, though an easy out. Ovid and I both benefited, didn’t we? He’s still read two thousand years later, and I’m still walking the Earth. Which is more than I can say for you, at this point.” She shoved her wiggling hair back up under her scarf, and called out to Olly.